Caravan Tea Towel and Hand Towel gift set for anyone who loves a caravanning holiday. Caravan Tea Towel and Hand Towel gift set for anyone who loves a caravanning holiday. 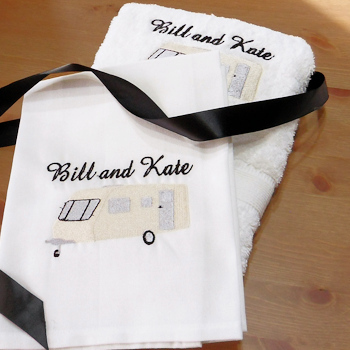 A embroidered caravan design and personalised name(s) on a white cotton tea towel and a white cotton bathroom hand towel. Both items personalised in your choice of text and text thread colour and font style. Caravan Tea Towel and Hand Towel gift set for anyone who loves a caravanning holiday. A embroidered caravan design and personalised name(s) on a white cotton tea towel and a white cotton bathroom hand towel. Both items personalised in your choice of text and text thread colour and font style. Tea Towel measures approx. 42x73cm Hand Towel measures approx. 49 x 90cm Useful hand and tea towel gift set perfect for all caravan club members!